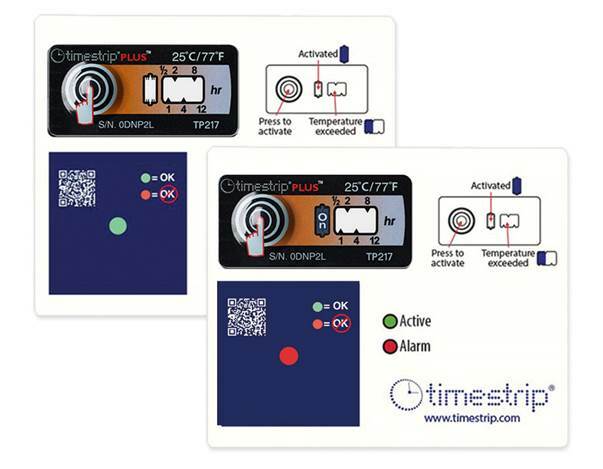 Timestrip is producing temperature indicators to alert users when medical products have been stored or transported outside their designed temperature range. Smart indicator technology supplier, Timestrip is launching a new ‘Controlled Room Temperature’ (CRT) indicator product that provides evidence of temperature breaches in the storage or transport of medical products outside the 15°-25°C (59°-77°F) range. Designed for medical and pharmaceutical sectors, the indicators travel with the products from manufacturer through to end user, and will give a clear visible indication if transport or storage conditions have moved outside the acceptable temperature thresholds. While Timestrip products are routinely used for the monitoring of pharmaceuticals, vaccines and blood at lower ‘chilled’ temperatures, controlled room temperature or ‘ambient’ shipping and storage is an increasing concern for the healthcare sector around the world as adoption of international Good Distribution Practice (GDP) increases. The new product will be produced from April, and will offer a low cost, highly reliable assurance of correct handling, reducing waste and assisting compliance.